Hanna LOVES her Daddy. Her Mommy? This first thing I’m going to say about “Baby Teeth” is that it won’t be for everybody. And that’s OKAY! I’m not going to judge anyone for liking it OR not liking it. It’s a fiction book! A book about a child wanting to kill their mother is not going to be light suspense…it’s likely going to be an uncomfortable read. So I knew what I was getting into…. for the most part. The book opens with Hanna at the hospital having a CT scan. It’s not her first. There have been many tests. Hanna knows how much Mommy wants her to talk. Is Hanna choosing not to talk? Hanna’s favorite game is “Scare Mommy” and she likes to make special projects for Mommy too. VERY special. WOW! I have such conflicting emotions about this one! Imagine having someone who you expect will love you, not love you. And not only do they not love you? They LOATHE you. They wish you didn’t exist…. The story is told from Hanna and Suzette’s alternating perspectives. There are some terrifying and dysfunctional scenes in this book. I haven’t read “The Dinner” or “We Need to Talk About Kevin” (books that this has been compared to) so I wouldn’t know how it stacks up against them. “Baby Teeth” seems to be in its own league. However, there are a couple of movies that came to mind for me…“The Omen” and “The Good Son”. All rolled up into a ball of darkness and wickedness that will make you squirm. I couldn’t put this sucker down. I read it in two sittings and honestly, when I wasn’t reading it, I was thinking about it. I wondered if a seven-year-old was capable of some of the acts committed. Could a child be that diabolical and manipulative? I think this is one of those books that if you look at it closely, yes you will probably see a lot of things that push the believability envelope…right off the table. However, it ended up not mattering if things were all possible or believable…. I was pulled right into the story. As I said earlier, this book won’t be for everyone. I do wonder if it would fit more into the horror genre. I found it diabolical and creepy and I’m really glad I read it. 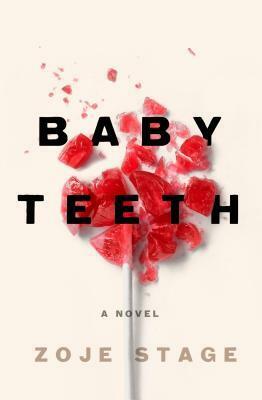 “Baby Teeth” is definitely a book I won’t soon forget. I’m very curious to see what Zoje Stage is going to come up with next. Thank you to St. Martin’s Press for the opportunity to read this book in exchange for my honest review. Terrific review, Diane! I’m looking forward to receiving my copy. It’s been a while since I’ve read something bordering on horror and I think it’ll be a great change of pace. I’m excited to hear your thoughts on this one, Ann Marie. Lots of different opinions!! Great review! Sounds very unsettling, but also that it was done well. If it kept you reading and made you think, then I guess it’s a success. Not sure I could handle it though! Thank you! It is very unsettling at times. There are lots of mixed reviews already. A diabolical and Creepy read!! I have this one on my TBR and this review makes me excited for it! It looks pretty messed up. I’m saving it for when I need something a little different. Great review! Thanks, Stephanie! It’s definitely messed up! I’m really excited to hear your thoughts on it!! Deanna my thoughts exactly! And I think it should definitely be classified as horror! Fab review! Not sure It’s for me right now, but who knows in the future? I understand! I like how you’re keeping your mind open for the future. If and when you decide to read it, I would love to hear what you think! You have convinced me that I need to read this book – I, enjoyed is completely the wrong word but I don’t know what the right one is, We Need to Talk About Kevin and The Dinner and this does sound in exactly the same kind of vein. Those books that pull you into the story even if on a rational level are not exactly believable are the most skilled ones I think and I’m keen to read it for that reason alone. Fab review! Thanks! I really want to check those books out too. I agree that “enjoyed” isn’t the right word and I don’t know what the right one is either! I really can’t wait to hear what you think!! Great review! I have a copy of this I’m looking forward to sink my teeth into! I’m really excited to hear what you think of it, Nicole! This sounds so chilling and from what you describe it does sound like it has we need to talk about kevin vibes. And as creepy as that was to read, it was really worthwhile, so I want to check this out too. Great review! Excellent review. Sounds sinister. I’m scared. Thanks! It does have some creepy parts! Lots of mixed reviews!! Thanks!! That’s a perfect way of putting it! I hope you read it I’d love to hear your thoughts. I have just requested for this on NetGalley after reading our review. It sounds dark, chilling and quite captivating. I hope that I will get approved. Great review! Thank you so much, Diana! Lots of mixed reviews and I would love to hear what you think. I hope NG approve it very soon!